The fascinating pets of Zahramay Falls come out to play in the new DVD - Shimmer and Shine: Magical Pets of Zahramay Falls. In this magical DVD collection, viewers are introduced to Shimmer and Shine's exotic animal friends including a rainbow tiger, a color-changing fox and more! Fans can join their favorite genies-in-training and their fur-ever friends as they compete in a talent show, rescue stolen jewels and swing from vines to cure a case of Dragon Pox. No matter the circumstances, Shimmer and Shine are ready to use teamwork to solve any problems that come their way. 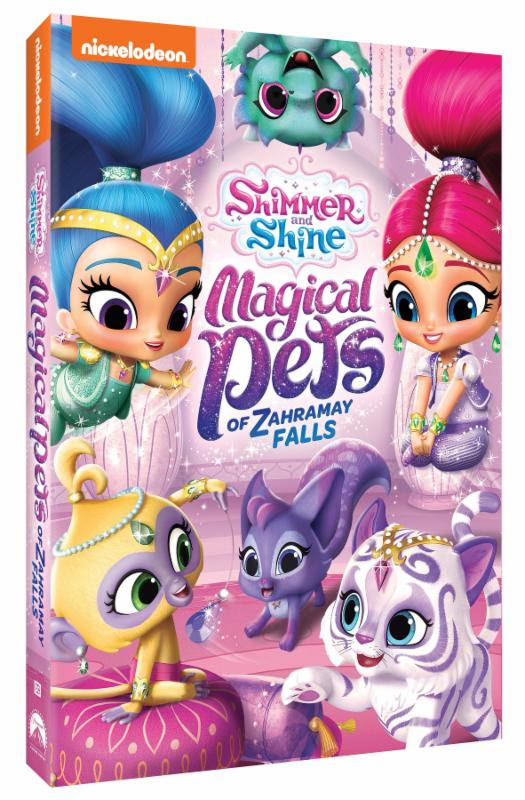 Produced by Nickelodeon Home Entertainment and distributed by Paramount Home Media Distribution, Shimmer and Shine: Magical Pets of Zahramay Falls will be available on DVD August 22, 2017, for the suggested retail price of $14.99. Untamed Talent - Leah's Fox, Tala, Nahal, and Zayne all compete in the Zahramay Falls Pet Talent Show to win a wish from Princess Samira. Zeta enters Nazboo in the talent show and cheats to help him win so that she can have the prize for herself, but her plan backfires. Pet Bedroom - When Tala and Nahal accidentally get loose in Zahramay Falls, Leah and Parisa must track them down before Shimmer and Shine notice they're gone. Zany Ziffilon - Zac offers to pick a pet for Kaz and wishes up a Ziffilon (part lion, part eagle). The pet isn't exactly what Kaz imagined; he's huge, he's clumsy, and worst of all, he pounces on everything! When the Ziffilon runs away, the gang must venture out to bring him back before he causes any trouble. Now You See Her - After Zeta captures a rare Zahramay fox with color-changing fur, she uses the fur to make an invisibility potion so that she can steal gems from Samira. Now, it's up to the girls to save Samira's jewels and give the fox a new home. Dragon Pox - Nazboo is sick with a case of Dragon Pox and the only thing that can cure him is a magical dragon pepper from a dragon pepper tree. Leah, Shimmer and Shine must use some clever thinking to get the tree to give up the goods. Bungle in the Jungle - Samira sends Shimmer and Shine to find the legendary Jungle Gem which is hidden in an abandoned temple deep in the jungle. Once in the jungle, Leah, Shimmer and Shine, along with Tala and Nahal, find themselves dealing with glittery quicksand, colorful insect creatures and a giant tiger as they hunt for the hidden gem. Potion Control - When a potion mixing lesson goes awry and Samira is nowhere to be found, the girls turn to Zeta for help. Boom Zahra-Mom - When Zeta accidentally grabs the wrong egg for a potion, a baby bird hatches and thinks Zeta is her mama. The girls must help Zeta return the bird to its nest before the bird's real mom finds out. My kids loved Shimmer and Shine: Magical Pets of Zahramay Falls. My two year old Sierra has watched it over and over. I was so surprised even her brothers love it! It is bright magical and colorful. I love all the different mini episodes it keeps them entertained for hours! Make sure to enter the giveaway here!